Right as I'm typing this, the 2012 Labour Day Classic is on and the Saskatchewan Roughriders are up 52 to zip against the Winnipeg Blue Bombers, oh how embarassing!? I decided why not be a true hoser and drink the beer of a brewery located in the province of the winning team, in this case - Saskatchewan. So, today I review Paddock Wood's 606 IPA. As a child, I was a big fan of trains, I loved the loud horns, loved seeing the train go by on the prairies at any time of the day hauling grain and I wanted to be a Train Engineer when I grew up, but that never did happen. Now days, I'm a big beer geek but still have an interest in trains that has remained to this very day. 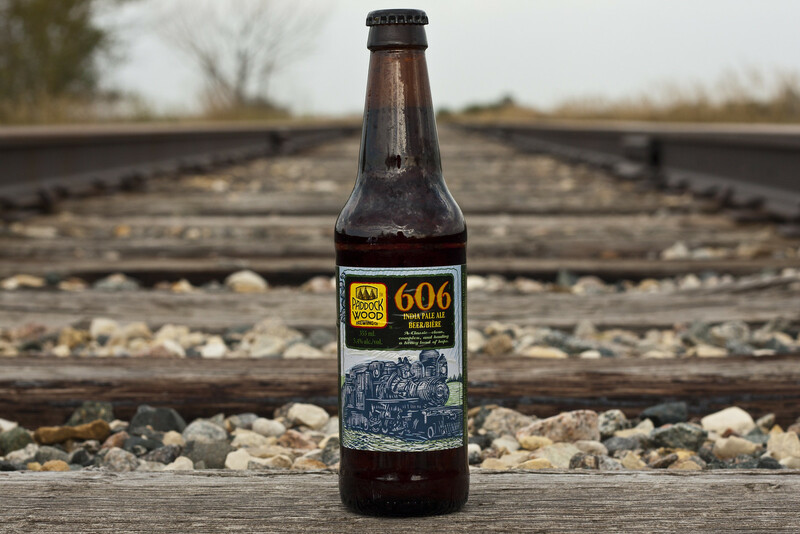 So the idea of a beer homaging a train on the prairies appeals to me. Paddock Wood beer was available for around two years in Manitoba, you could get their Bête Noire and Czech Mate beer fairly reasonably. Spring 2011, Paddock Wood disappeared from shelves completely. Now, summer 2012, Paddock Wood's 606 IPA and Czech Mate beers have made a return to Manitoba market. Both beers are only available individually and in 355mL bottles at a rate of just under $3/bottle. Appearance: A heavy reddish honey brown ale appearance, quite glimmering and tempting to sip on! Decent thick creamy head that's only slowly going down. Aroma: A caramel maltiness blended with a bit of a grassy and floral hops, quite a sweet smelling IPA overall, not that bitter. Taste: In a way, it reminds me of a scotch ale in the sense that it's much more of a sweet and caramelly taste that hits you overall than your usual bitter citrus IPA. It is certainly sweet and following it is the floral bitter hops. Very much no where near as bitter as the standard IPA, but the bitterness of the hops certainly cling to your tongue for a while for a bitter aftertaste. Clean tasting, a warm day on the patio sort of IPA. As the ber warms up, the bitterness of the hops start to open up and less sweetness, very much complex! Overall Thoughts: I expected a hoppy hoppy hoppy IPA with a balance of citrusness, but in this case, it's more of a more mellow yet sweet caramelly IPA. It's quite enjoyable as there's a great medley of caramel maltiness balancing with a subtle bitterness among others. So now the Bombers/Riders game is over, and Riders won.